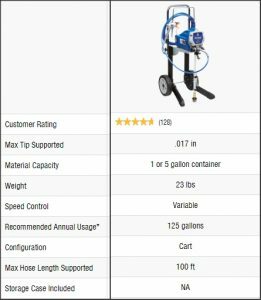 This review of the Graco Magnum X7 Airless Paint Sprayer is unbiased, detailed, and to the point. Before writing this review, I have researched the experience of previous users of this product, expert advice, and other reviews. This is done provide you with accurate and complete information. So, at the end of this guide, you should be able to decide whether the Graco Magnum X7 Sprayer is for you or not. The Graco Magnum X7 Paint Sprayer has a lot of positive reviews going for it. It is praised by hobbyists, professionals, DIY homeowners and the likes for its good performance. The versatile and durability has earned it a good household item for handling projects around the house. And since it allows for a variety of materials to be sure, you have all your painting needs covered especially if you are a basic user. It is only suitable for commercial light usage, could have some overspray. To avoid this, use mask on areas you don’t want to spray. You can also do some test runs so you get a feel for it and its spraying pattern. The motor casing feels cheaply made although the price says it all and the most complaint about it is that of over-spraying and clogging problem. It is a valuable addition to both professional and home DIY homeowners who are looking for a sprayer on budget. As you probably already know, it is important you update your knowledge on this unit before buying it. If this is your first time of reading the reviews on the Graco Magnum X7 Paint Sprayer, you will soon find out that there are a lot of things you need to know about it. And going through this review will not only help you understand the essence of the product, you will also be able to make an informed decision. Some of the important things you need to know will be covered in this section and the section that follows. On the one hand, if you are a homeowner, you now have the ability to carry out smaller painting jobs without the recurrent expenditure. On the other hand, if you are just starting out your professional carrier, you can add the Magnum X7 Paint Sprayer to your toolbox for capturing the smaller jobs while saving money. If you can ensure an ongoing maintenance of this unit, you can get up to 2-3 gallons output in a week or up to 125 gallons per year. The Graco Magnum Paint Sprayer really packs a punch. It comes with the Auto Prime feature – which is missing in other competing models – that provides quicker priming for you. 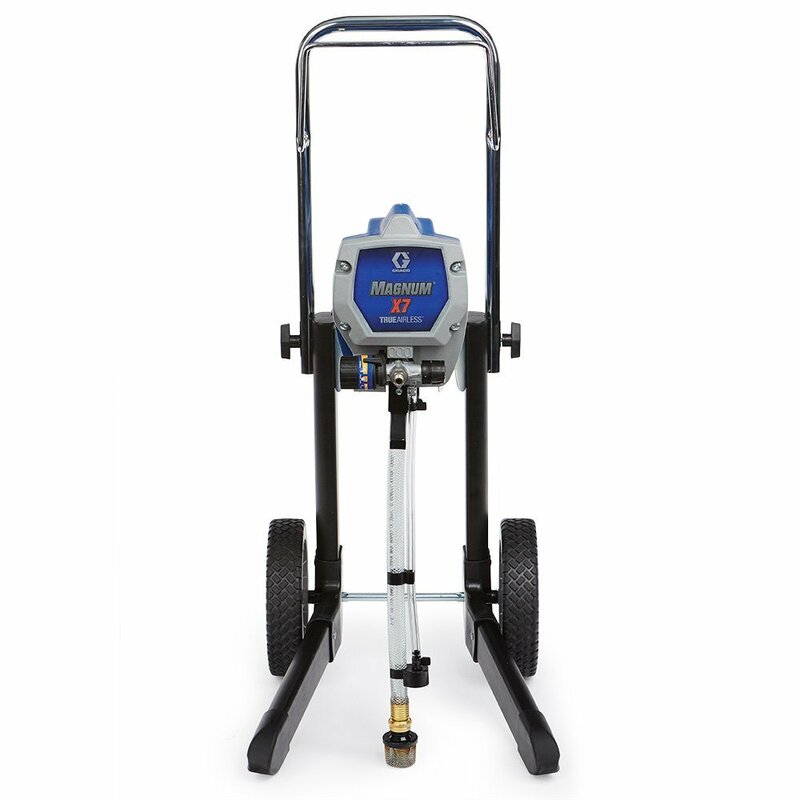 Its stainless steel piston pump also ensures your job is easier when it comes to painting and the Power Flush Adapter connects snugly to a garden hose to boost your cleaning pace. It comes with SG2 Metal Spray Gun, RAC IV 515 Switch Tip, 25ft Duraflex Paint Hose, Pump Armor Fluid, Power Flush Adapter, Quick Startup Guide and Operation Manual. The Graco Magnum X7 Sprayer is a DIY and small project paint sprayer. It is the perfect tool for your house remodeling needs, fence painting, and cabinet refinishing. Not only can it be used with interior walls and ceilings, it will also make painting your deck and façade a piece of cake. With this sprayer in your toolbox, you should expect to save a lot of money from contractors and handyman every time you need to do a small job. You should get The Tip Extension with RAC IV Tip Guard. This accessory helps you spray high, low or recessed areas like soffits, overhangs, ceilings, decks without the need for ladders or stepstools. It is available in 10-inch, 15-inch, 20-inch, and 30-inch with the latter being the most expensive. Check it here! Another useful accessory is the Graco Pump Armor that helps protects your sprayer’s pump when you store them. All you have to do is fill the pump with the Pump Armor fluid and keep it until you need it. If you normally paint recessed areas like ceilings or similar place, you may need a Hose Connector to connect an airless hose with your sprayer. Check this one out. And the airless hose can be purchased along with your sprayer. There are two sizes, 25 Feet and 50 Feet. Both will give you additional lengths to end the reach of your sprayer for peaks or second stories. You can also check out the 3M Hand-Masker Dispenser if you are looking for precision tape tracking and something to use with your masking paper. The Graco Magnum X7 Airless Paint Sprayer is lightweight, portable and can be used with light stains, thick latex, acrylics and more. It doesn’t work well with solvents, solvent-based lacquers, and texture. The box content includes a metal SG2 spraying gun with a full trigger that has a built-in filter and RAC IV 515 tip. It can support a max tip of 0.31 GPM that works with 5-gallon or 1-gallon paint bucket. The unit also comes with 25ft of airless Duraflex paint hose, an 80z of Pump Armor fluid to store it. Although new users may find the setup daunting, the instructional manual that comes with it should clear things. Users will also find the printed quick start guide and the instruction DVD useful during initial usage. Finally, the Graco Magnum X7 is easy to clean and compact to store, thanks to the fold-down handle. The rugged frame on the Graco Magnum X7 Sprayer comes with a set of wheels that makes it easy to move it around. You don’t have to carry it around with you hand – which cause hand fatigue and eventually make the job boring. If you have back issues, you will enjoy your work with this sprayer because it only weighs 23 pounds. Moreover, it comes with a cart so that you can cover a wide area without stressing too much. The suction tube no the Graco Magnum X7 Airless Paint Sprayer allows you to use both 1 & 5-gallon containers and the bigger buckets can easily go onto the pail hook above the suction tube so you can carry it around. The sprayer features high-quality motor and adjustable pressure with the motor being 5/8 HP which gives it the power to push out lots of pressure. It is capable of outputting 3000psi through its 50ft hose. You can also get a 100ft hose if you need to do a larger project and you can enjoy 0.31 gallon/minute in spraying. This paint sprayer also has an adjustable pressure control with symbols that allows you to spray from high to low. The Graco Magnum X7 comes with a power flush adapter which you can connect to a garden hose and enjoy lesser cleaning time. Not only does it make cleaning convenient, it also makes it a fun part of the job. The unit also has a Power Plug that is lighted and can give you immediate feedback. The Reverse-A-Clean spray tip on this sprayer means that the paint tip can be reversed and cleaned-up. This can become very handy when you have a clog that can delay your work and make life stressful. A Power-Flush system is also included to make cleaning a piece of cake. It has a chrome plated handle that clamps so that you can easily store the unit when it’s not in use. The Graco Magnum X7 is 15% more powerful than the X5 even though it is not a professional sprayer. With a universal motor of 5/8 HP, a pumping ability of 0.31 gallons a minute and 3000psi, you get more on the X7 than you can on the X5. In addition, the piston pump is made from stainless steel, which means that it will last longer under frequent use than the X5. Not only that, it is more powerful, can use a longer hose up to 100ft, and a larger tip up to 0.017, which is good for spraying thicker paints. They are similar in the hose section as they both come with two flexible hoses with one being used for priming and pressure release and the other for placing the sprayer in the bucket. Does the Graco Magnum X7 work with water and oil-based paints? The overspray is actually manageable since it is airless. Airless sprayers are better at managing to spray than compressed air models. In addition, matching the tip of the sprayer to the type of paint you are using will reduce the chances of overspray. The manufacturer states that you can use up to a 100ft hose. However, be aware that you would be stretching the parts a bit more and that might lead to a shorter lifetime of the unit. Will this run off 220 volts? No. It will not. You have to convert the 220 volts down to 120 volts. You can buy a transformer with at least 2000 Watts for those living in the Philippines, even if you are running at 60Hz frequency, it shouldn’t be a problem. Will this run in the UK? This unit will not work in the UK with the additional conversion equipment. You would need 120V, 60Hz power. You can just buy equipment designed for the local electrical supply specification. Yes. The hose is included; you don’t need to buy another one. The one included is 25ft but you need to buy another one if you need something longer than that. Will this work with elastomeric paint? Is this model worth buying? If you intend using it a lot for different projects around the home or if you are a professional looking for an item to manage small regular projects, it is a good choice. However, if you are looking for occasional use like a few times in a year, you are better off hiring a contractor. One of the deciding factors in buying is the Graco Magnum X7 Price. Many people have found it to be decent based on this. With all the features packed in the Magnum X7, you will get the job done perfectly and accurately. The unit has Auto Prime, a feature that ensures that you get your priming job done quickly without losing the quality. The piston pump is made of high-quality stainless steel material that is capable of withstanding the everyday wear and tear. It also has a well-designed cart and paint movement mechanism that allows you to easily move it from one angle to another, without causing any fatigue to your hands. So, if you are doing a project that spans a wide area, you should not have any problem using this unit. You can also boost your cleaning with the Power Watch Adapter which allows you to connect a garden hose to the unit for a far more superior job. With all the features, it is clear that the Graco Magnum X7 Airless Paint Sprayer is one of the best paint sprayers out there that you can get your hands on.